Go ahead. Criticize this comic. I dare you. Your opinion means nothing to me. Unless you like it, in which case your opinion means everything. Usually, I don’t use people’s real names in my comics out of respect for their privacy, but in this case, I feel the need to write the name. If, by some magical coincidence, that dude recognizes himself as the perpetrator and wants to apologize for the 3 years of hell through which he put my vulnerable, pre-adolescent self, he’s welcome to step up. I get that I was an annoying kid, that I was weird and a know-it-all and and a tomboy, that I dressed all wrong and didn’t comb my hair enough and had zero ability to read social cues. So you know what would have been cool, if you found me so terrible? Leaving me the hell alone. Not calling me names, not encouraging everyone else to call me names, and definitely not punching me in the face on the school bus. I can attest that it actually does not kill you to be compassionate toward people you don’t like. I do it all the time and have not yet died from it. Sometimes, if you’re really compassionate, you can offer them a few words that may actually help them become less odious. Sometimes people really don’t know what they’re doing wrong, and they could use a little help. But we still get people like the ones in panel 6, who go around justifying their own jerkiness with circular reasoning. You know how you could stop bullying? By not being a bully. It’s so simple. If it’s not simple to you, then guess what: you are what is referred to in popular parlance as a sociopath. Unless you actually believe that you’re the only real human being in the world and other people are merely set pieces for your drama, you can reduce the amount of suffering in the world by not causing it. Don’t hurt other people to make yourself feel better. Obviously, there are always going to be narcissists, but we have a choice. We can bow down to the tiny percentage of cruel humans out of fear that we might be singled out as the next target, or we can stand up to tyranny by protecting those who have less power, because there are actually more nice people than horrible ones, and there is power in numbers. We don’t have to fight. All it takes is a few kind, honest words. If today’s kids get anti-bullying lessons (i.e. are taught empathy and compassion) then maybe tomorrow’s adults can fix the terror of a world that wants us to believe that might makes right and that self-esteem is a zero sum game where you can only win by taking from someone else. I’m not thin-skinned, but bullying is just another form of abuse, and like all abuse, it leaves its mark. It’s an indelible trauma. Yes, it will happen, but no, we can’t ever normalize it. The crimes of childhood have to be forgiven, because children’s brains aren’t done yet, but for adults to condone awful behavior is not forgivable. Having grown into my dragonhood, I’m over my childhood, but I’m never to going to be over the childhoods of people who are still children. I’m never going to stop protecting people from monsters. 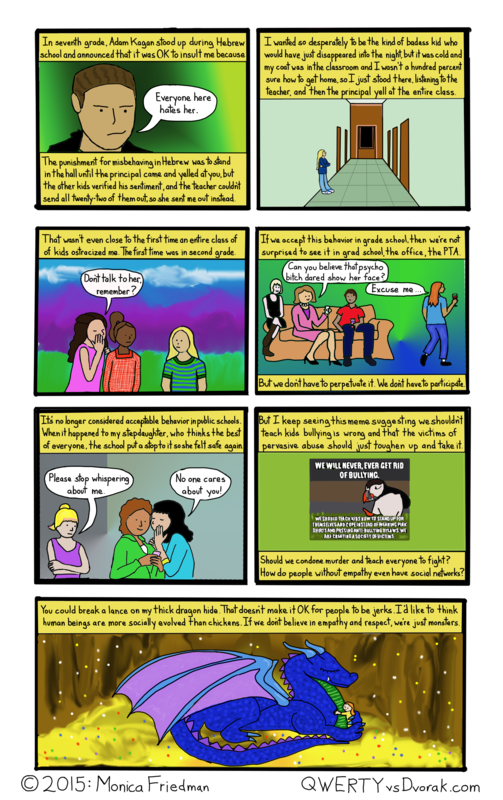 This entry was posted in comic, webcomic and tagged bullies, bullying, comic, compassion, empathy, friends, isolation, kids, loneliness, meanness, memes, respect, social, webcomic on November 3, 2015 by littledragonblue. I wish I could get drunk more often as these are absolutely the best comics to read while drunk!